We see that the small but accurate basis set orbitals can be generated by the orbital optimization. In Fig. 16 we show the convergence properties of total energies for molecules and bulks as a function of the number of unoptimized and optimized orbitals, implying that a remarkable convergent results are obtained using the optimized orbitals for all the systems. In this illustration of a methane molecule, the optimized radial orbitals are output to files 'C_1.pao' and 'H_2.pao'. These output files 'C_1.pao' and 'H_2.pao' could be an input data for pseudo-atomic orbitals as is. This means that it is possible to perform a pre-optimization of basis orbitals for systems you are interested in. The pre-optimization could be performed for smaller but chemically similar systems. 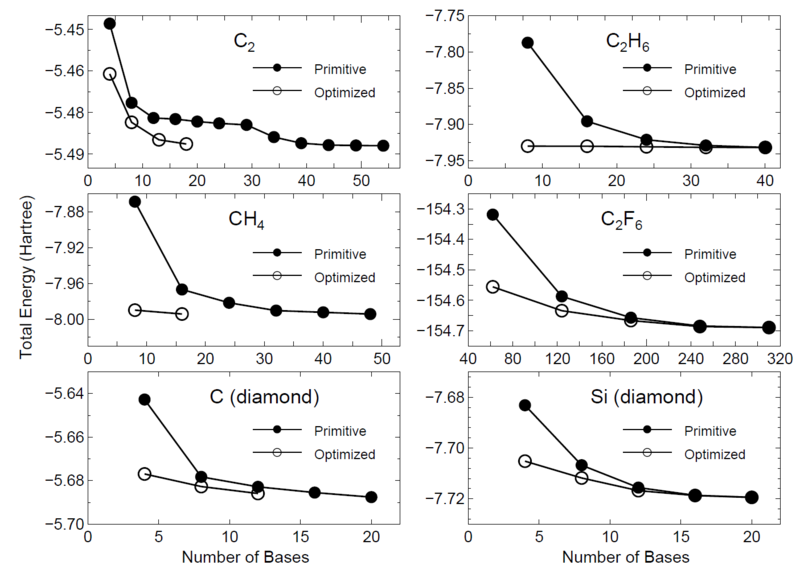 Figure 16: The total energy for a carbon dimer C , a methane molecule CH , carbon and silicon in the diamond structure, a ethane molecule C H , and a hexafluoro ethane molecule C F as a function of the number of primitive and optimized orbitals. The total energy and the number of orbitals are defined as those per atom for C , carbon and silicon in the diamond, and as those per molecule for CH , C H , and C F .